10 August 2016: Welcome to see the Evening Standard today include a major comment piece by Leo Johnson on how “Small-scale projects such as those in Newham, Brixton and Islington give a glimpse of Britain’s energy future”. Leo highlights three projects in London as signs of how the decentralised energy model is now in the ascendancy, shifting from the “dominant energy model, the centralised production and distribution of fossil fuel-based power through the grid”. “In Newham, for example, the Combined Heat and intelligent Power plant (CHiP) aims to harness the energy from “fatbergs”, the bus-size balls of grease which cost Thames Water an estimated £1 million a month to remove, using teams of trained “flushers” decked out with protective white suits and shovels who descend into London’s Victorian sewer system to hack up the fat. CHiP plans to use the fat instead to power 40,000 homes.” This project is fascinating and received a lot of coverage when first announced back in 2013 – which was covered in some detail in an earlier post here – but not much further information has been forthcoming from the project on their website. “At the Bunhill Energy Centre project in Islington, whose second phase was opened by Mayor Sadiq Khan last month, they’re using heat from the Northern line tube to power a thousand homes.” Lots more about Bunhill here. Leo also highlights some work commissioned by the GLA by engineers Buro Happold “have estimated that there is enough heat wasted in London alone to power 70 per cent of the city’s energy needs. What’s the potential for growth? Copenhagen provides 98 per cent of its space and water heating through district heating, at 45 per cent of the cost of normal oil heating bills. London’s uptake, better than the one to two per cent national average, is currently just five per cent.” The 2013 London Secondary Heat study can be downloaded here. April 2016: Sutton Council have recently issued a tender to support a planning application “for the construction of district heating pipes on behalf of the Authority” (specification here). 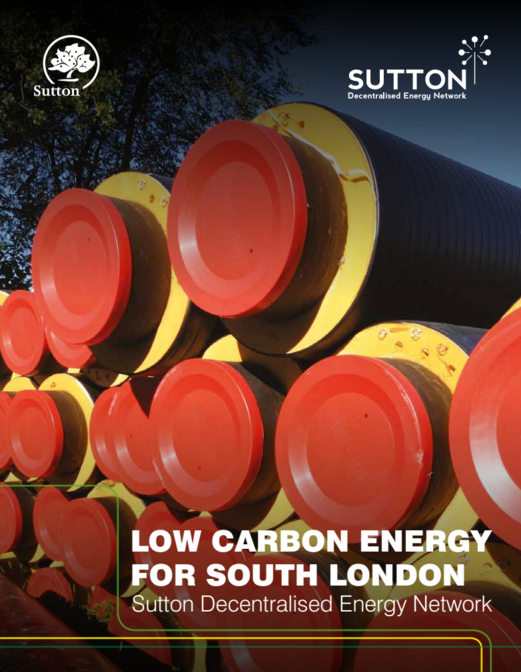 Opportunity Sutton highlight how the “project will utilise waste heat from the proposed Beddington Energy Recovery Facility (ERF) and existing landfill gas engines, both of these are owned by Viridor.” Further details are available in the following brochure. October 2015: This month the Mayor has been asked questions in relation to: the number of London projects awarded funding from government’s Urban Community Energy Fund (UCEF); minutes of the London Plan Energy Advisory Group meetings; helping reduce energy bills for Londoners who have electric heating; GLA loan to Tempus Energy; the impact of the closure of the Green Deal; minimum energy efficiency standards on London’s Private Rented Sector; support for the Governor of the Bank of England’s recent comments on carbon disclosure (and again) ; the FIT consultation and it’s impact on London’s solar industry (and again here); suppliers on the Mayor’s new RE:NEW energy efficiency retrofit framework; London Pension Fund Authority (LPFA) investment in the fossil fuel sector; projected returns from investments made by the London Energy Efficiency Fund (LEEF); planning approval of the Beddington incinerator; a health impact assessment for Beddington incinerator; London Plan requirements for borough planning carbon offset funds; London business risk and financial exposure to a ‘carbon bubble‘; climate sceptic views; Greenwich Power Station update; LED lighting on the Great West Road; production of BioSNG in London; tackling fuel poverty; the rollout of smart meters in London; supporting London businesses resilience to climate change; and an update to the License Lite process. 26 October 2015: Plans for the development of the London Riverside Opportunity Area have been progressing for some years now (see post here). Following a consultation earlier this year, final plans were adopted by the Mayor of London on 23 September 2015 as Supplementary Planning Guidance (SPG) to the London Plan and published online and launched at a public event at the NLA on 22 October 2015. London Riverside is one for 4 Opportunity Areas (OA) covering a wide scale development in the East of London comprising London Bridge, Canada Water, Deptford Creek/Greenwich Riverside, Isle of Dogs, Lower Lee Valley, Upper Lee Valley, Ilford, Greenwich Peninsula, Charlton Riverside, Woolwich, London Riverside, Bexley Riverside and Abbey Wood and Thamesmead. The planning frameworks across they areas are at at different stages of development: further information on them can be found here. The London Riverside OA covers some 2,500 hectares encompassing parts of Barking and Dagenham and Havering, adjoining the borough boundary with Newham in the west, and forms part of the Thames Gateway growth area. The planning framework has always discussed proposals for an area wide district heating initiative and the revised set of Opportunity Area Planning Framework (OAPF) documents includes a ‘Decentralised Energy‘ chapter which identifies “opportunities for decentralised energy production and the development of a satellite district-heating networks across the OA that interconnect over time to supply locally produced low to zero carbon energy“. 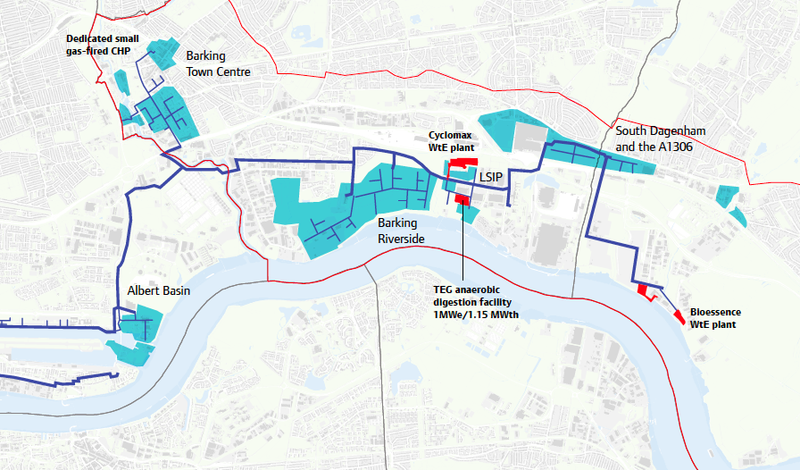 There are number of planned and existing decentralised energy schemes within the London Riverside area (as shown in graphic above) which the planning document considers as part of the area’s energy strategy, . The third presentation by Ian Smith, Head of Sustainable Services, Southwark Council, on London’s first energy from waste district heating network, can be found here. How the Mayor’s programmes will respond to the forthcoming IPCC’s (Intergovernmental Panel on Climate Change) 5th Assessment Report; the Mayor’s “climate sceptic views“; London’s growing energy demand; £145k spend on climate change adaptation; the amount of energy generated from waste incineration; the number of GLA officers working on energy efficiency retrofit; the amount of ECO funding that could be directed to London; the operation of the RE:FIT schools energy efficiency programme in Harrow; the RE:FIT schools programme in Brent; Government’s proposed changes to building regulations and its potential impact on London Plan energy requirements; the Mayor’s response to DECC’s Community Energy – Call for Evidence; the Mayor’s support for community energy schemes in London – such as Brixton Energy; publication of the latest London Energy and Greenhouse Gas Inventory (LEGGI); the cost of producing ‘Using Local Powers to Maximise Energy Efficiency Retrofit – How to’ materials for London’? (report here); the terms of loans provided by the London Energy Efficiency Fund (LEEF); extending LEEF loans to the private sector; details of the LEEF Advisory Committee; consultancy companies working on LEEF; the amount spent by LEEF; the number of loans given out by LEEF; rollover energy contracts for SMEs; Londoners energy bills; the amount of renewable electricity provided by Source London electric vehicle charging points; funds previously spent on adding energy efficiency measures to Metropolitan Police buildings currently for sale; developing a Fuel Poverty Action Plan for London; the supply of electricity to London’s electric vehicle charging points; the supply of electricity to London Underground; London Green Deal targets; a London Green Roofs map; the Mayor’s Green Deal assessment on his home; stimulating Green Deal finance packages; spend of the Green Bus Fund; funding received from the Green Bus Fund; identifying brownfield land in London suitable for sustainable energy projects; CO2 savings achieved by the Mayor’s climate change programmes; potential for the London Pension Fund Authority to invest in low carbon energy projects; when the next update to the Mayor’s Climate Change Adaptation Strategy is to be published; how climate change will affect London’s summer temperatures; new anaerobic digestion plant in Surrey; the level of waste being directed to the Beddington incinerator; the London Plan’s policies on incineration; the Mayor’s approval of the Beddington incinerator; if the Mayor had pressed for the Beddington project to develop as a anaerobic digestion plant; if the Beddington incinerator can operate in combined heat and power (CHP) mode; heat network around the Beddington incinerator; the growth of waste incineration in London to 2016; the role for future incineration in London; local planning controls and fracking; the fracking potential in London; details of the new RE:NEW domestic energy efficiency programme; targets for the new RE:NEW programme; the choice of the Capita Group to manage the new RE:NEW programme; GLA buildings that have been treated by the RE:FIT programme; whether the Mayor’s Environment advisor had visited the Kings Cross CHP and district heating scheme.